Before moving to California from Maine, I was as organic then as I am now. I’ve always been. I was raised on my grandparents gardening… pre-Monsanto, is probably the best way to describe it. I’ve never used weedkillers. There are natural repellents, people. Try marigold in your garden to ward off bugs. I never understood why each year my grandmother surrounded her garden with a marigold patch. Now, I’m the grandmother… I totally get it. What I also “got” in the early 80s, when I saw a bottle of Fetzer Vineyards wine, is what a smart direction to take! Yes, we bought the wine from our wine shop in Auburn, Maine. I have a very clear memory of that organic wine. 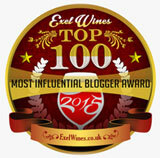 I’m also thrilled that the organic and biodynamic program is spreading with great success. Onward and upward. What does an organic winery look like? 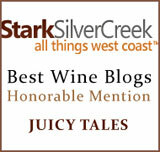 Just like any other winery. The real difference is what you don’t see, like sheds filled with chemicals that are going to be spread on the grapes and ground. 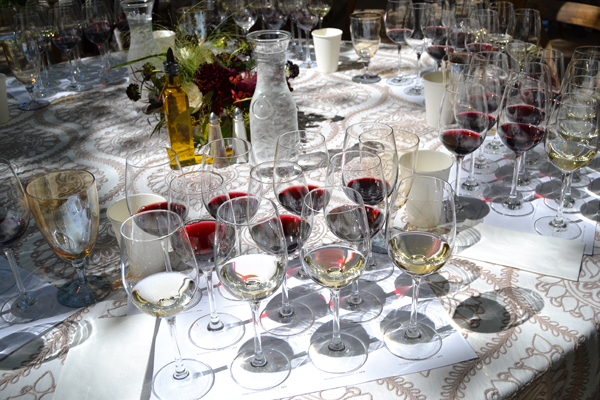 Anyone who might think wine causes allergic reactions, is probably not thinking about all of the chemicals that the wine grapes might have received, too – well before they’re even harvested. Certified B Corporations are leaders of a global movement of people using business as a force for good. They meet the highest standards of overall social and environmental performance, transparency and accountability and aspire to use the power of business to solve social and environmental problems. There are more than 2,500 Certified B Corporations in more than 150 industries and 60 countries with one unifying goal – to redefine success in business. 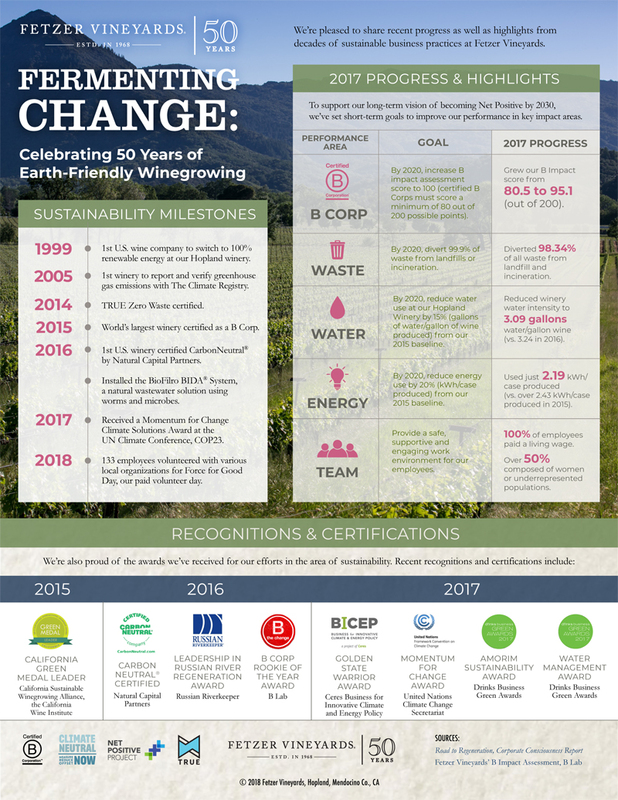 Fetzer Vineyards, the sustainability pioneer celebrating its 50th anniversary of Earth-friendly winegrowing, has been recognized as a “Changemaker” among certified B Corporations. The Changemakers List, published today, highlights global B Corporations that made the most positive improvement on their overall impact, based on an independent, comprehensive assessment administered by the nonprofit B Lab. 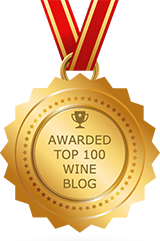 This award recognizes Fetzer Vineyards’ measurable, verified progress towards enhancing its leadership in sustainability in the wine industry and beyond. The largest winery in the world certified as a B Corporation, Fetzer Vineyards is among the first recipients of the Changemaker honor. The distinction comes at an exciting time for the vintner, which in 2017 was the only wine company among 19 global recipients of a “Momentum for Change” Climate Solutions Award for climate action at the U.N. Climate Change Conference in Bonn, Germany (COP23). B Corps are for-profit companies that meet rigorous standards of social and environmental performance, accountability and transparency. The B Impact Assessment, which all B Corps undergo as part of the certification process, focuses on four key areas: Governance, Workers, Environment and Community. The Best for the World: Changemakers list honors the improvement made by B Corporations from one certification to the next, with re-certification occurring every three years. “We are humbled by this recognition, which highlights our company-wide efforts to continue to evolve and improve our sustainability initiatives,” said Cindy DeVries, chief operating officer of Fetzer Vineyards. “We have a strong foundation of environmental focus dating to the last century, and today we are expanding on that to increase our overall positive impact as a company.” Last year, Fetzer Vineyards detailed its 2020 sustainability goals and initiatives in a report titled “Road to Regeneration.” Fetzer Vineyards’ latest B Corp Impact Assessment is also available online. Since obtaining B Corp status in 2015, Fetzer Vineyards improved its score by nearly 15 points, from 80.5 to 95.1, marking significant progress towards its goal of a 100-point score by 2020 (Certified B Corps must obtain a minimum of 80 out of 200 possible points on the assessment scale). Looking to the future, the B Corp framework will continue to guide Fetzer Vineyards’ sustainability strategy. “At Fetzer Vineyards, we strive for continuous improvement, and being a part of the B Corp community has pushed us to make tangible positive improvements in every area of our business, from our employees to communities to supply chain, ” said Elizabeth Drake, regenerative development manager at Fetzer Vineyards. 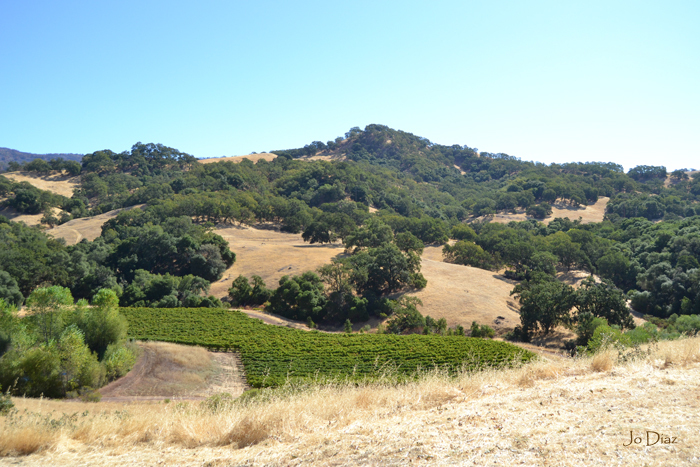 In keeping with its plans for continuous improvement, Fetzer Vineyards has set a goal to be Net Positive by 2030. This includes plans to replace all negative impacts with positive impacts that enhance and regenerate ecosystems and communities while producing sustainable growth for its business and shareholders. 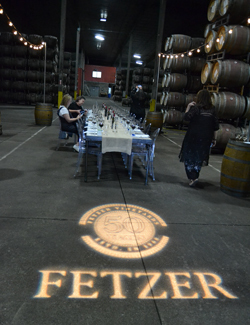 Celebrating its 50th anniversary in 2018, Fetzer Vineyards was founded in 1968 by Barney Fetzer in Mendocino County, California. An award-winning purveyor of wines and spirits spanning multiple origins and available in more than 50 countries worldwide, Fetzer Vineyards is a leader in sustainable business practices, organic winegrowing, and craftsmanship in the cellar. In addition to robust offerings under the winery’s flagship Fetzer label, the winery also crafts the leading wine from organic grapes, Bonterra Organic Vineyards, named American Winery of the Year by Wine Enthusiast magazine in 2016. 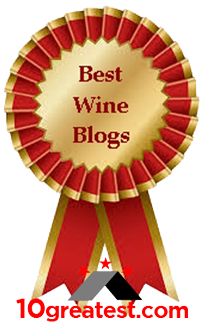 Other California offerings include Adorada, Anthony’s Hill, Jekel Vineyards, Sanctuary Wines and 1000 Stories, the original Bourbon barrel-aged wine. Part of global winery Viña Concha y Toro, Fetzer Vineyards imports iconic South American wines such as Chile’s most-acclaimed wine, Don Melchor, as well as the Cono Sur, Viña Maipo, Marques de Casa Concha, Casillero del Diablo and Frontera labels from Chile, in addition to Argentina’s Trivento Reserve. Recently, Fetzer Vineyards entered the ultra-luxury wine and spirits category by forging a partnership with Kentucky Peerless Distilling Co. to sell its historic craft rye whiskey. I am honestly not sure if I want to obtain organic or nonorganic wine as they differ in the taste can easily be tasted. I prefer the nonorganic one as it has a longer life once you open the bottle and keep it in the open. I prefer to know there’s as little chemical intervention as possible. I was organic long before it was even called “organic.” When I look at many of my contemporaries, I’m thankful that I did stay chemical free (with the newly called “organic”). When I went into a supermarket and saw “conventional” fruits and veggies, I asked, “What’s conventional?” He answered, the ones with the poisons. (Thankfully, no boss was around.) We laughed. Chemicals have eventual side effects, as proven by all of the disclaimers on prescription drugs… So much so that drug companies decided to list the side effects, so they can’t be sued anymore. So, I stay away as much as possible, and it’s paid off. Not on any drugs, took an Aleve the other night, but only because I stretched too hard in yoga. When my wine bottles are opened, it also doesn’t take too long to enjoy the contents, so this doesn’t impact my decisions. And, we are all different, so I also respect your right to choose otherwise. Ciao!